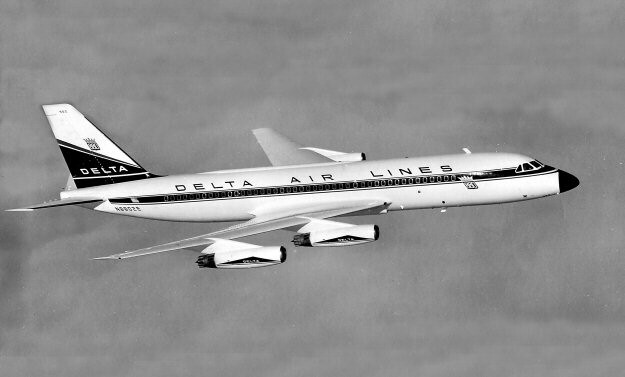 10 February 1960: Delta Air Lines’ Superintendant of Flight Operations, Captain Thomas Prioleau Ball, Jr., made the delivery flight of Delta’s first Convair 880 jet airliner, Ship 902, named Delta Queen, FAA registration N8802E, from San Diego, California, to Miami, Florida. Other members of the flight crew were Captain James H. Longing, co-pilot, and First Officer Richard E. Tidwell, flight engineer. Newspapers reported that Delta Queen‘s wheels started rolling on the runway at San Diego’s Lindbergh Field (SAN) at 10:11:46 a.m., Pacific Standard Time (18:11:46 UTC). The airplane took of and climbed to its cross-country cruising altitude of 33,000 feet (10,058 meters). The Convair 880 landed at Miami International Airport (MIA) at 4:42:08 p.m., Eastern Standard Time (21:42:08 UTC). The official flight time was 3 hours, 31 minutes, 54 seconds, for an average speed of 641.77 miles per hour (1,032.83 kilometers per hour) over the 2,266 mile (3,647 kilometers) route. This was a new United States National Record for Speed Over a Commercial Airline Route. 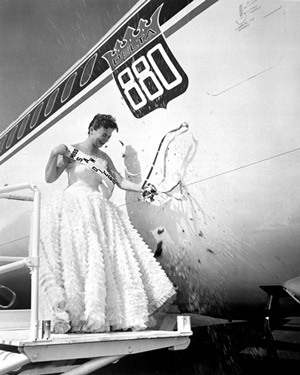 The 880 cut 27 minutes, 1 second, off the time of an Eastern Air Lines Douglas DC-8B over the same route, 4 January 1960. Delta Queen was placed in scheduled service 15 May 1960. The Convair 880 was a four-engine, swept-wing turbojet-powered commercial airliner. It was operated by a flight crew of three and could carry up to 110 passengers. The Convair 880-22-M was a modified version of the standard 880-22, intended for shorter range operations. It had leading-edge slats, a higher maximum takeoff weight, stronger landing gear, a tail skid and an improved anti-lock braking system. The Convair 880 was so-named because its design top speed was 880 feet per second (600 miles per hour, or 966 kilometers per hour), faster than its Boeing 707 or Douglas DC-8 rivals. The airplane was 129 feet, 4 inches (39.421 meters) long with a wingspan of 120 feet (36.576 meters) and overall height of 36 feet, 3.75 inches (11.068 meters). The 880 had an empty weight of 94,000 pounds (42,638 kilograms) and maximum takeoff weight was 191,000 pounds (86,636 kilograms). The Convair 880-22-M was powered by four General Electric CJ805-3B turbojet engines. The CJ805-3B is a single-shaft, axial-flow turbojet with a 17-stage compressor section and 3-stage turbine, based on the military J79. The engine has a maximum continuous power rating of 9,800 pounds of thrust (43.593 kilonewtons) at Sea Level, and 11,650 pounds (51.822 kilonewtons) for Takeoff. The CJ805-3B is 9 feet, 2.4 inches (2.804 meters) long, 3 feet, 3.9 inches (1.013 meters) wide and 4 feet, 0.8 inches (1.240 meters) high. It weighs 2,875 pounds (1,304 kilograms). The 880-22-M had a cruise speed of 0.82 Mach (556 miles per hour/895 kilometers per hour) at 30,000 feet (9,144 meters). The service ceiling was 41,000 feet (12,497 meters). Maximum range was 5,056 miles (8,137 kilometers). The Convair Division of General Dynamics built 65 Convair 880 airliners at San Diego, California, between 1959 and 1962. 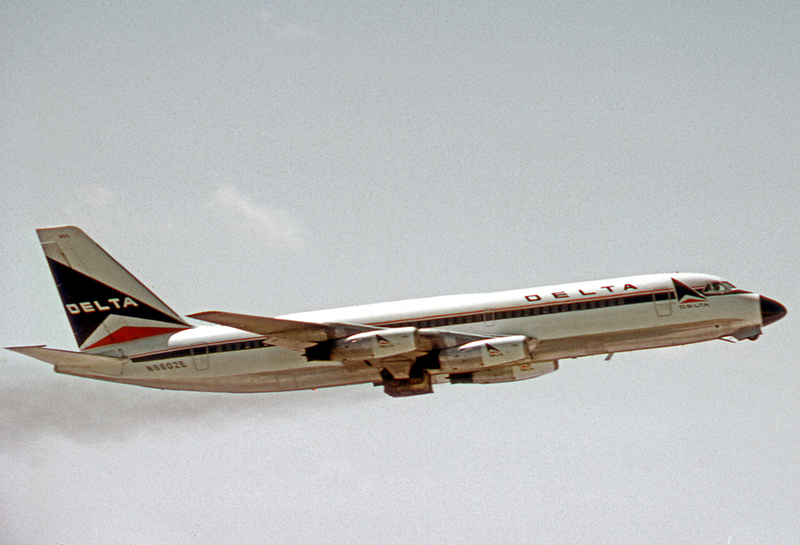 Delta Air Lines retired its last one in January 1974. 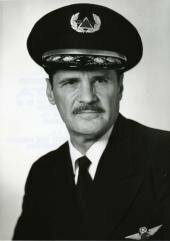 Thomas Prioleau (“Pre”) Ball, Jr., was a legendary airline captain. He was born 6 September 1906 at Norfolk, Virginia, the second son of Thomas Prioleau Ball, a bookkeeper, and Agnes Mae Bell Ball. He grew up in Florida. Ball learned to fly in 1928, soloing in a World War I Curtiss “Jenny” biplane. Thomas P. Ball, Jr., married Miss Theresa Augusta Daniel at the Church of the Good Shepherd in Jacksonville, Florida, 27 December 1930. They would have to sons, Thomas Prioleaux Ball III and Espy Daniel Ball. Ball worked as a station manager for Delta Air Lines at Charleston, South Carolina, and was hired as a copilot by the airline in 1936. Soon after the United States entered World War II, Ball was commissioned as a second lieutenant in the U.S. Army Air Corps. By the end of the war, he had risen to the rank of colonel, serving as the Chief of the Prevention and Investigation Division of the Army’s Office of Flying Safety. After the War, Ball returned to Delta Air Lines as a captain and soon became the chief pilot, dedicated to the meticulous training of the company’s pilots. In 1969, Ball became Delta’s Vice President of Flight Operations. On 25 May 1970, Ball was aboard Delta Flight 199, a Convair 880 under the command of Captain Harris B. Wynn, when it was hijacked to Cuba. Four U.S. National Speed Records which were set by Captain Ball remain current. In addition to the record set with the Convair 880, on 6 November 1948, Ball flew a Delta Air Lines Douglas DC-6 from Los Angeles, California, to Charleston, South Carolina, in 6 hours, 24 minutes, 32 seconds, at an average speed of 344.19 miles per hour (553.92 kilometers per hour). On 18 March 1954, he flew a Douglas DC-7 from Los Angeles to Jacksonville, Florida, in 05:29:33, averaging 392.25 miles per hour (631.27 kilometers per hour). Finally, on 24 February 1962, Captain Ball flew a Douglas DC-8 from Miami, Florida, to Atlanta, Georgia, in 01:28:11, for an average of 406.1 miles per hour (653.56 kilometers per hour). After making the delivery flight of the company’s first Boeing 747, Ball grounded himself when he noticed a deterioration in his eyesight. Thomas Prioleau Ball retired from Delta in 1971. He passed away in 2006 at the age of 99 years. Convair 880-22-M N8802E, Delta Queen, (c/n 7) remained in service with Delta Air Lines until 1973 when it was sold to Boeing as part of exchange for an order of new Boeing 727-200 airliners. It was then sold to Transexecutive Aviation in 1974 and reregistered as N55NW. 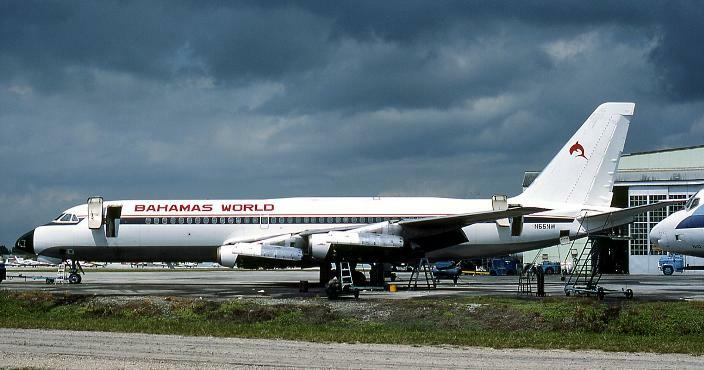 In 1976, the 880 flew as a charter airliner for Bahama World. It was then converted to a cargo freighter operating in the Caribbean. In 1979 the Convair was transferred to Groth Air Service, Inc., Castalia, Iowa, and assigned a new FAA registration, N880SR. The record-setting airliner was damaged beyond repair in a fire at Licenciado Benito Juarez International Airport, Mexico City, in May 1983.